True 1200 dpi resolution with 256 levels of gray. Up to a maximum of 3,100 sheets and 5 paper trays including the bypass tray. Feed up to 110 lb. media from most trays. First page out time is less than 4.5 seconds. Finisher with single and dual stapling available. 50-sheet Duplex Automatic Document Feeder (1-1, 1-2, 2-1, 2-2). Can be upgraded to add scan, e-mail and other network options. High-speed fax modem and JBIG compression. Maximum duty cycle up to 125,000 pages per month. Breakthrough Emulsion Aggregate (EA) Toner delivers sharper, more uniform image quality, longer fuser life and less waste. Virtually unlimited scan and program ahead while the device is busy printing. This true multi-tasking means you never have to wait! Smart paper trays sense paper size and automatically match the requirements of the input. 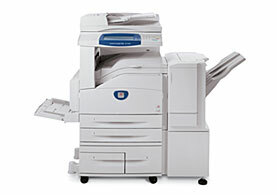 Powerful fax features include high-speed modem, JBIG compression, speed dials and group dials. Fax 2-sided documents automatically and also print incoming faxes 2-sided. A short paper path makes paper handling extremely reliable- even for heavy or specialty papers. Job Queue shows all jobs queued in the system and allows easy job prioritization. Supplies are easy for anyone to replace, which keeps the machine running without the need for a service call. Loaded with features found only in high-end devices like annotation, build job and transparency separators plus sets. A large, easy to use touch screen graphical interface and integrated control panel provides convenient access to all advanced features. Finisher option has ability for single and dual stapling with multiple position selections. EA toner that results in a longer fuser life and less waste giving you better reliability and a lower total cost of ownership over the life of the machine. Automatic 2-sided copying saves on paper costs and is environmentally friendly. Negative image feature for black-and-white images with a lot of background saves toner consumption. Multiple-up prints multiple pages on a single sheet, saving paper. Fast page out time of less than 4.5 seconds, reduces wait time at the copier. Most documents are fewer than 5 pages so how fast the first page is delivered is a key indicator of copier performance. Stored programming allows you to store commonly used jobs in memory, so you recall the job quickly, load the originals and press start. Consumable supplies are long-lasting and designed to be easily replaced by anyone and without a service call. Transparency separators enable you to place dividers between pages, and to make hard copy sets to handout, all in one easy operation. Print reports to quickly get information like billing meters, fax mode settings and system data. Build job to divide a job into numerous segments and apply unique programming to each individual segment. Annotation enables you to add text like page number, date or a predetermined phrase to the copy output. Covers allow you to feed the front or back cover page of the document from a different media tray, with or without imaging and also one-sided or two-sided imaging. Mixed-sized originals allows you to scan originals of different sizes in one job to produce either mixed size or common sized output. Auto Reduce/Enlarge proportionally reduces or enlarges the image on the copies based on the size of the original and the size of the selected output paper. Auto Tray Selection where the machine chooses the correct paper for the copy job based on the size of the originals being scanned. Poster to enlarge an original document onto multiple sheets of paper that can be pasted together to make a large poster. Booklet Creation reduces the size of each page by 50% and prints two pages per sheet. It prints the pages in the correct order so the document can be folded and stapled to form a booklet. Multiple-up enables printing of more than one page on a single sheet. One-up, two-up or as many as eight-up printing on the same page. This environmentally friendly feature decreases the consumption of paper and ink. * Capacities are approximate, based on 5% coverage on a letter/A4-sized page and dependent on customer job mode run length.